Financial problems can happen for a few reasons: a lost job, a layoff, a failed business, a medical crisis, a student loan that can’t be repaid, etc. Entrepreneurs may especially be prone to financial disaster if their business idea goes south and costs more money than planned. This book is a step-by-step process taken by author George Sheridan out of the financial pit he found himself in. 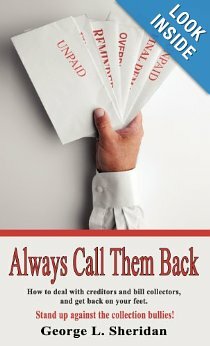 The book’s title, Always Call Them Back, refers to the advice to always call back creditors. Creditors will call your family members, which may embarrass you. You’ll miss out on getting help if you don’t face your situation. You can’t hide—they’ll eventually find you. Legal actions will take place anyways and you’ll lose the ability to control payments if you don’t communicate. The first two chapters tell you how to control when and how you receive collection calls and letters as well as how to talk to the creditors. It turns out that creditors use scripts and often bring on a third person into the conversation to play a good cop / bad cop scenario on you. The advice in the first part of the book helps you deal with this and gives you an overall system for handling the process of receiving calls from collection agencies. These chapters offer some personal advice from the author as to how you can take care of your health through his process. George also shares some stories of mental abuse you may suffer from some collection agencies. He provides some horror stories he’s heard from others as well as a few minor incidents he encountered first-hand. At the end of the book the author tells you which organizations he went with. In these two chapters you’ll receive advice on what kind of time frame you have for repayment given the amount of debt, as well as recommendations for how to begin telling family and friends about your financial circumstances. Once your set on repaying some debt you’ll need to figure out who to pay first. Plus, you may want to know how to talk to the people you owe money to. The author gives some guidance here on prioritizing repayments along with specific scripts you can use over the phone. Remember, the collection caller is likely very well-trained in how they approach you, so you need to be prepared in how you respond. The end of the book wraps up nicely with the author’s success stories on repaying his debt. He also discusses his status on many other fronts such as his health, income, and other personal activities during the repayment process. George also talks about how he was glad to write this book for others to read because he could not find this advice when he needed it. I hope I stay clear of financial troubles such as the author mentioned in this book, but its nice to know that a very short and concise book exists on the subject. The nice thing about the book is that it was written from someone who is currently going through the repayment process and not just commenting on it from an outsider’s view. I’m sure that you’ll relate to the author’s stories if you happen to also be in the same boat. The other aspect to the book that I didn’t mention was George’s plea that people do their part to reform the laws pertaining to collection agencies. The book shows that some collection processes could be improved with some more safeguards against abuse. In that way, this book could be useful to those inclined to understand more about such abuses still taking place and what the author recommends for having them curbed.